Let's Stamp! : 2012-2013 Idea Book is out now! 2012-2013 Idea Book is out now! The fabulous new Idea book is already out! This is the largest catalogue that we have ever had in the UK and we now have the majority of the products that the American SU! team have! I've already placed my first order and I'm eagerly awaiting lots of new goodies to play with, which I promise to share with you in due course. If you don't already have a copy of the catalogue in your hands, then click on the cover image on the side bar to see more, or contact me for your very own copy. If you are anything like me, as soon as you look at the new catalogue your wish list is going to be as long as your arm! If so, how do you fancy getting £130 worth of Stampin' Up! goodies for just £99? Plus as demonstrator you will be able to buy products with a 20% discount! You don't need to hold workshops, you don't even need to sell the products, you can just order fabulous stamps that you want at a great discount. You want more? Well how about FREE designer paper for 6 MONTHS too?! FREE DSP when you sign up! That’s right! Get FREE Designer Series Paper for SIX MONTHS* when you become a Stampin’ Up!® demonstrator during October or November. *You need to place an order (of any value!) 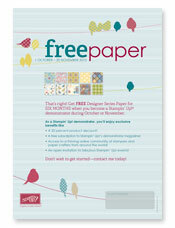 each month to receive your choice of free designer paper that month. • A 20 percent product discount! 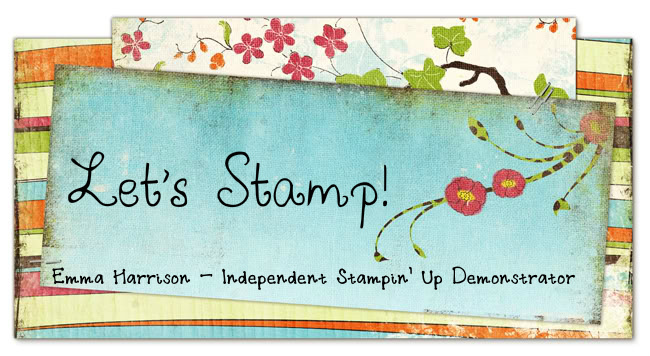 • A free subscription to Stampin’ Up!’s demonstrator magazine! • Access to a thriving online community of stampers and paper crafters from around the world! • An open invitation to fabulous Stampin’ Up! events! Don’t wait to get started—contact me today! You can even sign-up online by clicking the link below, but I would suggest why not contacting me to have a chat first and I can explain it all to you! 2012-2013 Idea Book & Catalogue Blog Hop!